The ancient Tamil music was the music of the ancient Tamil people, who resided in the lands of the ancient Tamil country. Many poems of the Sangam literature, the classical Tamil literature of the early common era, were set to music. There are various references to this ancient musical tradition found in the ancient Sangam books such as Ettuthokai and Pattupattu. The early narrative poem Cilappatikaram, belonging to the post-Sangam period 200 CE - 400 CE also mentions various forms of music practiced by the Tamil people. Music was an integral part of the compositions of the Tamil Saiva saints such as Appar, Thirugnana Sambanthar and Manikkavasagar during the Hindu revival period between the sixth and the tenth centuries CE. The Sangam age grammatical work Tolkappiyam mentions the various music pertaining to the five landscapes (thinai) of the Sangam literature. The five landscapes are associated with a particular mood of the poem and to give colour to these moods, each had a musical mood (pann), a melodic instrument (yaazh) and a percussion instrument (parai). For example, the neithal thinai, which dealt with the incidents around the seashore and the theme of elopement, had the musical mood of sevvazhi, Vilari yaazh as the musical instrument and the navayapambai for the percussion. Tolkappiyam also mentions the musical form known as Paattu Vannam and various types of songs like Asiriapattu, Neduven pattu, Adivarai, Seer, Ahaval Osai and Vellosai, which are classified on the basis of the musical quality, metrical structure etc. Most of the Sangam age poetry utilised one or more of these meters in their compositions. Poems of the Ettuthohai anthology, such as the Natrinai, Paripaatal and Kaliththokai are extensively musical in nature and utilise various panns to create the mood. Poems of the Sangam literature contain numerous mentions of the various musical instruments such as the Seerkazhi , a stringed instrument of the Veena type and various percussion instruments such as murasu or muzham. Pattupattu contains a description of the yaazh, a stringed instrument. There were two types of yaazh, Periyaazh or the 'large yaazh' contained 21 strings, whereas its more compact companion Siriyaazh had only seven strings. 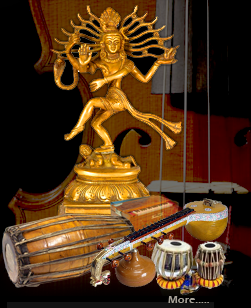 Two other types of yaazhs, Makarayaazh with 19 strings and Sakottuyaah with seven strings are also mentioned in Pattuppattu. However we have no further information on their actual appearance, mode of playing and the kind of melody generated by these instruments. The flute was the most popular wind instrument during the Sangam period. Perumpanarruppatai, one of the Pattupattu anthologies, describes the process of making the flute. The holes in the bamboo tube were bored using red-hot embers. The flute is also mentioned in the Kurincippattu as the instrument on which the shepherds played the ambal pann. Among the other wind instruments were the Pili, a small trumpet and Kanvidutumbu a larger flute ('as long as the trunk of an elephant'), perhaps producing lower octaves The flute also acted as a drone providing a constant pitch for vocalists and other instruments.